In New Orleans, brass bands have played a key role in the local music culture for well over a century. And as most everyone knows, much of what originates in New Orleans eventually has worldwide impact. King Oliver, Louis Armstrong, Red Allen, and countless other New Orleanians had formative experiences in marching bands, and Lester Young, who grew up across the river from New Orleans in Algiers, Louisiana, marveled at the music he heard brass bands play in the streets, on riverboats, and on the flatbeds of wagons and trucks. Danny Barker, who was born in the French Quarter in 1909, knew from brass bands. His maternal grandfather, Isadore Barbarin, played alto horn with the Onward Brass Band, and his uncle, drummer Paul Barbarin, composed “Bourbon Street Parade.” Barker lists over two dozen musicians to whom he was related, either directly or by marriage, in his memoir, Danny Barker: A Life in Jazz. 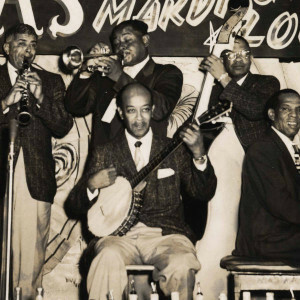 Barker’s first instrument was banjo, and he was only in his early teens when he ventured from New Orleans with blues piano legend Little Brother Montgomery to play turpentine camps in Mississippi, a state viewed dimly by people of color in New Orleans. He arrived on the promising New York scene around 1930, and over the next three decades, in addition to his work with Calloway, played with Lucky Millinder, Benny Carter, Sir Charles Thompson, Bunk Johnson, Eubie Blake, and his wife, the blues singer, Blue Lu Barker. Brass bands were in decline by the time Barker returned home, but preservation was in the air. Sandra and Allan Jaffe had established Preservation Hall, and its resident jazz band, in 1961, an undertaking that helped foster the sense of cultural uniqueness that remains prevalent in New Orleans today. As is often the case, it took outsiders like the Jaffe’s to shed the kind of light that inspires local players and institutions to wake up to the importance of their own traditions. But Preservation Hall’s focus was on the surviving elders who’d figured in the golden age of New Orleans jazz a generation or two earlier. Barker employed a different approach. Under the auspices of Fairview Baptist Church, he formed a brass band and recruited scores of youngsters to fill its ranks. Among the emerging players who came through the Fairview Baptist Church Marching Band were Leroy Jones, Greg Stafford, Lucien Barbarin, Dr. Michael White, Kermit Ruffins, Anthony “Tuba Fats” Lacen, and Shannon Powell. Fairview Baptist is credited with instilling pride and revitalizing the brass band tradition among youth. The Dirty Dozen Brass Band emerged from Fairview, and in the wake of its success in the early ’80’s, numerous other brass bands were established or re-formed, including the Re-Birth, Original Tuxedo, and Liberty Brass Bands. The renowned folklorist Alan Lomax, who began doing field work in Louisiana in the 1930’s and helped bring Jelly Roll Morton’s classic memoir, Mr. Jelly Lord, to print in the early 50’s, returned to New Orleans in 1982 to film the newly-established Dirty Dozen performing in a funeral procession and at that year’s Jazz & Heritage Festival. Danny Barker died in 1994, but his legacy continues in the wide array of brass bands that are ubiquitous on New Orleans street corners and at all manner of rituals from funeral marches and Mardi Gras stomps to Sunday afternoon Social and Pleasure Club parades. The documentary Tradition Is a Temple celebrates Barker’s legacy and these church and parade customs that continue to make the city an incubator and proving ground for young players. The 80-minute film explores the challenge of maintaining traditions in the modern world. Intimate discussions with contemporary New Orleans musicians highlight their history, upbringing, and how tradition has shaped their identity. The film’s cast includes drummer Shannon Powell, trombonist Lucien Barbarin, vibraphonist and drummer Jason Marsalis, vocalist Topsy Chapman, guitarist Steve Masakowski, and The Tremé Brass Band featuring Eric Calhoun. Tradition Is a Temple makes its area premiere on Monday, April 28, at Amherst Cinema. I’ll be there to introduce the film and moderate a discussion afterwards. Think of it as a vicarious way of attending this year’s Jazz & Heritage, which takes place between April 24 and May 4. Click here to find out more about this event. I am about to remix a 5 part radio series I did on Danny Barker. If you are interested in hearing it or even playing it, please contact me.